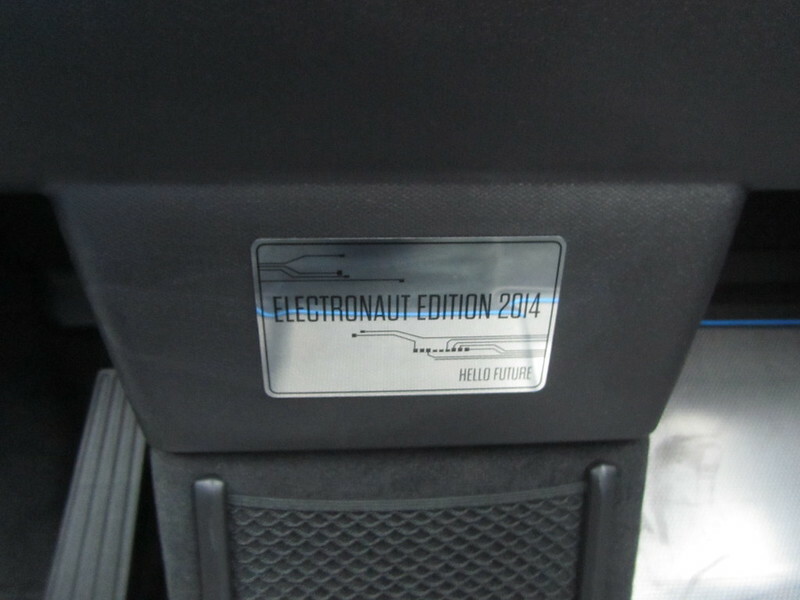 After a 23 week wait, the Electronaut Edition i3 that we configured (and re-configured) has finally made it to the dealership. Just in time for me to be on a trip, so, I didn’t get to see it until a few days after it arrived at the dealership. Here are some pictures of it as it arrived from the Port. The delay wasn’t ALL BMW’s fault. (well… they did delay deliveries, still.) Our original configuration was going to include a REX (Range Extender / basically a motorcycle engine with an anemic almost 2 gallon tank) that gave the car a combine 150-160 miles of range (of which approximately 70-80 miles are Electric). However, as it became evident that California was running out of the initial 40,000 Green HOV Stickers, I proactively requested that the REX be removed as I have access to charging on both ends of my commute anyway. 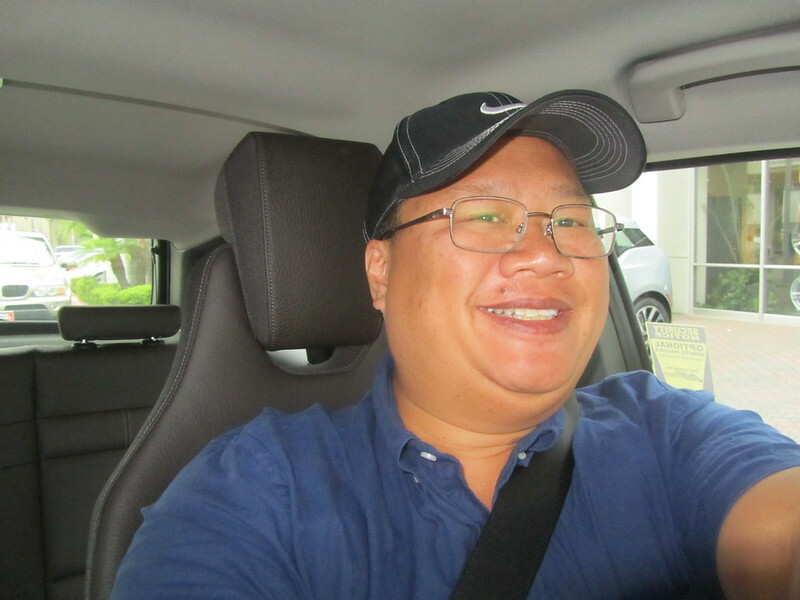 Even after the California Legislature approved an expansion to the program (without much needed adjustments), I stuck with the BEV (battery electric vehicle, no REX). In the meantime, I got used to driving our Tesla Model S on a daily basis while waiting for the i3 to be built and shipped to us. Three EVs may seem excessive, but I really enjoy a smaller sized vehicle for LA traffic and have felt that the Model S was just too big a car for me to drive in bumper-to-bumper traffic. Especially since I’ve been conditioned to cut in front of anyone as soon as space in the adjacent lane becomes available (also known as drive like an A**#0!3) and the Active E was the perfect size for that (small, quick, and visible), the Roadster is small and quick, but could be invisible to many. As the weeks ticked on, the little things that continued to bug me about the Model S became less of an issue, and I learned to adjust to driving the Model S in traffic. And still no i3. Both Tesla vehicles are “energy hogs” relative to my experience with the Active E (and to a lesser degree my mom’s Leaf.) This waste of electricity is a minor nit, but still a nit for the difference between Tesla vehicles and BMW i (and to some extent Nissan) electric vehicles. The Vampire Drain on the Model S is around six miles a night on my Model S when I don’t have it on power saving mode. I do this because I like the convenience of starting the car up and going right away. Battery Saving mode takes a delay to start up the vehicle. Additionally, I was having challenges with the AM Radio in my Model S. It’s a good system until one tries to listen to Vin Scully and the Dodgers, in which case it’s hit or miss. Especially with the current issue between Time Warner Cable and other TV network operators, it was hard to catch a Dodger game (outside of AM Radio.) Nevertheless, I live with it. (An 80-100 mile daily commute tends to emphasize in-car infotainment systems more than a short commute). 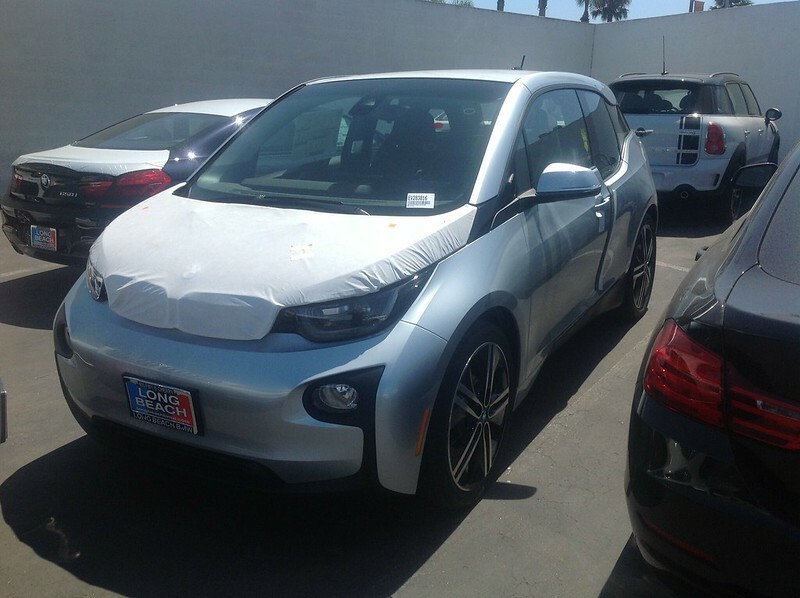 So, on August 3rd, I got to meet the i3 BEV that was built for us. I got to do a short couple of mile drive through Signal Hill and got to use the regen to descend a good, steep pitch (that originally sold us our X5 back in 2001). Test out the turning radius and other fun stuff on the car. 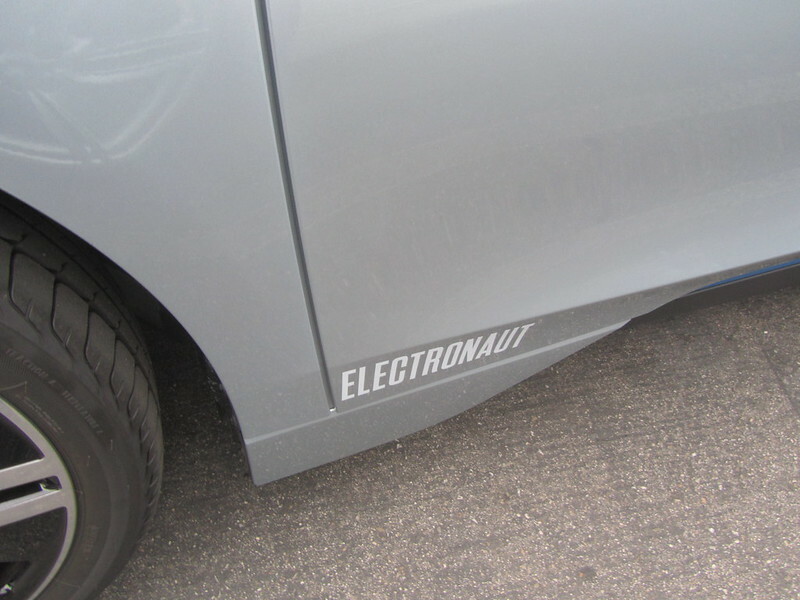 I liked the badging… It’s so much more understated than the circuit stickers on the Active E.
The BEV version of our order removed the automated parking assistance package. Not sure if it was an oversight or whether we did it because we did encounter some problems with this during one of our test drives. The car also forces one to rely on the GOM (guess-o-meter) as there is no SOC meter, as was reported months ago. Luckily, the tractor beam was still in place, but these two technical things coupled with adjusting to life with the Model S as my daily driver and my better half’s reluctance to garage her Roadster in favor of driving the Model S instead have made it a moot point. 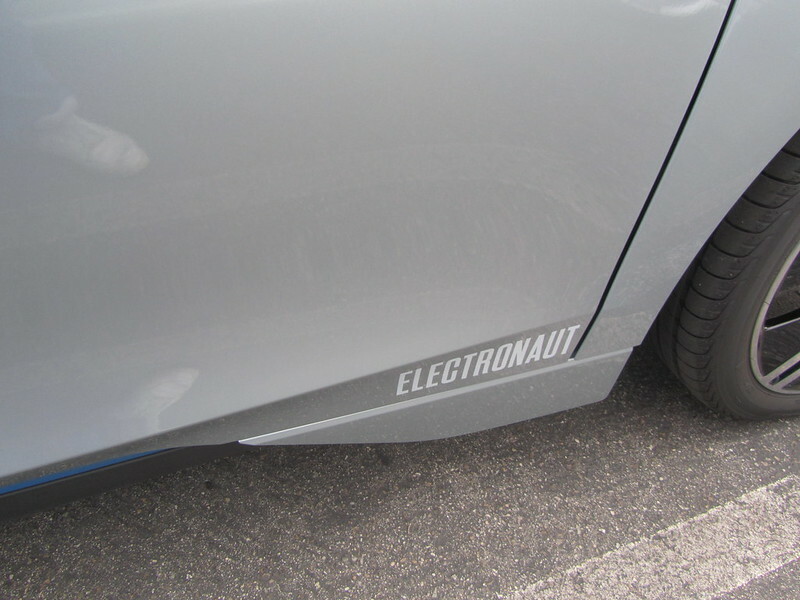 These missing items coupled with some issues I had during the wait with rude members of the sales management of Long Beach BMW, specifically Emilio Roukoz, have made the experience quite a contrast with my experience with Tesla Motors. Granted, I had some issues with Anish from Tesla as well during my pick up at the factory, but the person was NOT the management escalation. Considering that I’ve purchased or leased a couple of cars through my sales person at Long Beach BMW, I would expect better treatment than I received from his management. Does Tesla have the “right” model, I’d say it’s closer to it. Long Beach BMW is one of the better BMW dealerships, but it’s not perfect. They COULD take the extra step with the BMW i vehicles and apply for the HOV stickers on behalf of their purchasers as a dealer, but they don’t and that is an opportunity lost on providing better service than Tesla which could also do the same thing, but chooses not to provide such customer service. 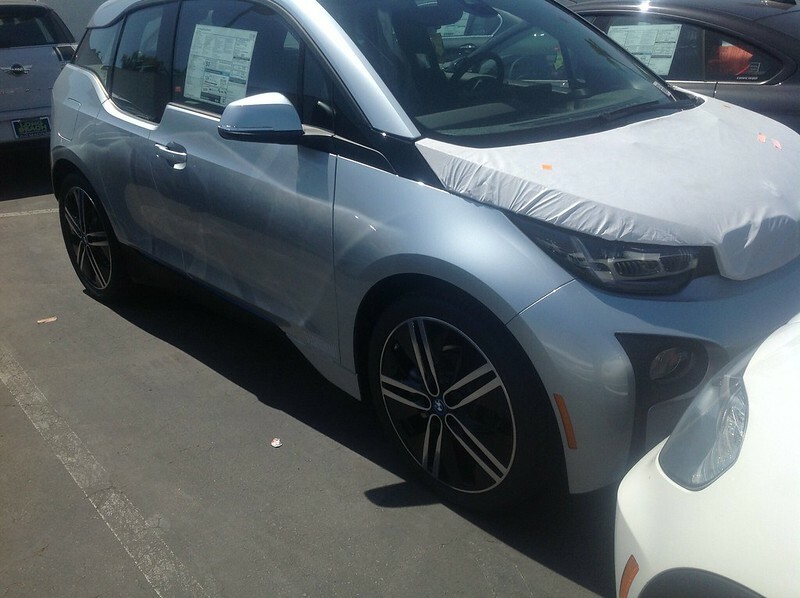 So, after all this wait, I notified our dealer yesterday that we will NOT be purchasing the i3 for us. 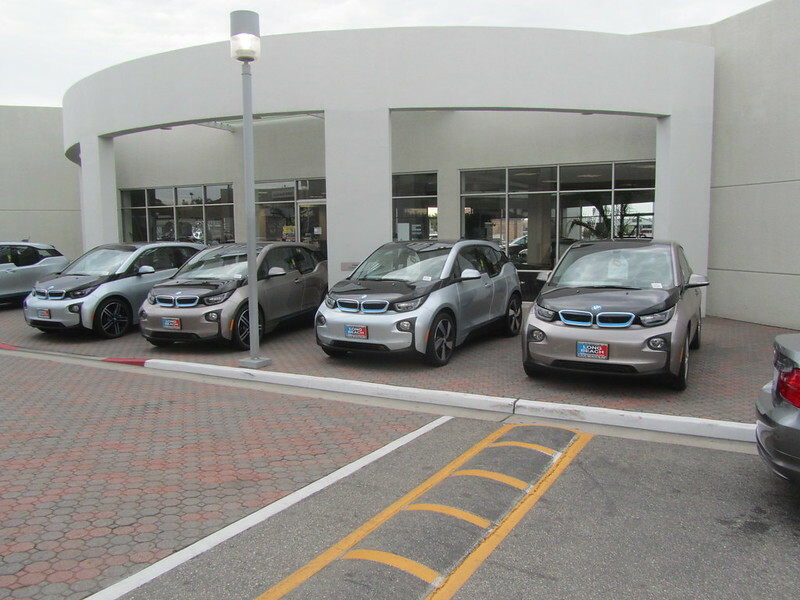 However, as I publish this post, one of my sisters and her husband is at Long Beach BMW and test driving this i3 and the other ones that are pictured below. 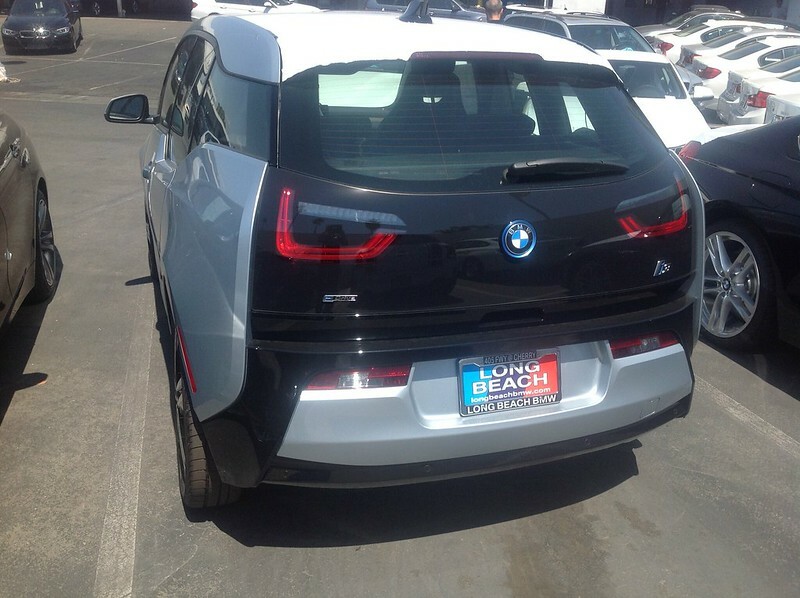 Who knows, this i3 might make it to the family after all. 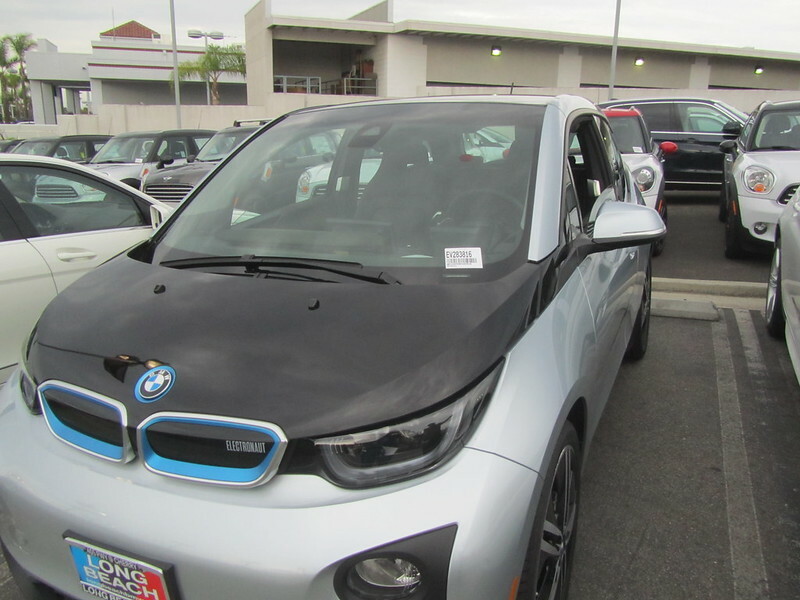 Fingers crossed, otherwise, it can join these i3s that I saw at the dealership on Sunday. Who knows if BMW will get us back as a customer. There are definitely things that I prefer with BMWs over the Teslas. 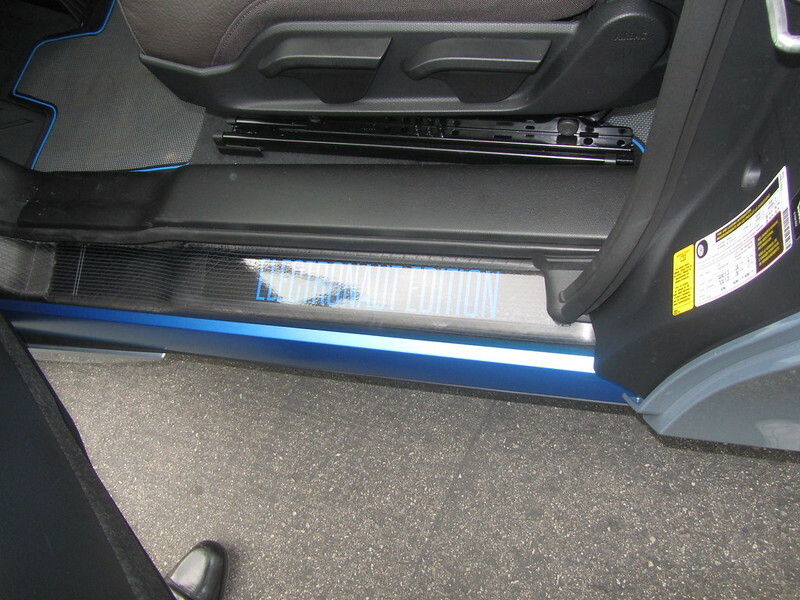 More pictures of the almost fully loaded i3 that we configured can be found on my flickr album. For +Toshi Clark and anyone else interested, when the original order was in place, I had requested that the dealership pre-order the HOV stickers (as they were allowed to do so at the time and the stickers were running out) for my original REX as soon as a VIN number is generated. This activity would have hedged my purchase of a REX i3 with HOV access. I provided a link to the dealership showing the procedure, process, and cost to the dealership ($8). The salesman was willing to do this and he was overruled by the “sales” manager. The point was moot as the green HOV stickers originally were suspended from this program about two weeks later to slow down the depletion rate. It was at that time that I changed the order to BEV and it became a non-issue, but the fact that I’ve bought vehicles from the dealership since 2001 and most recently obtained my Active E from the same location has given me cause to pause. 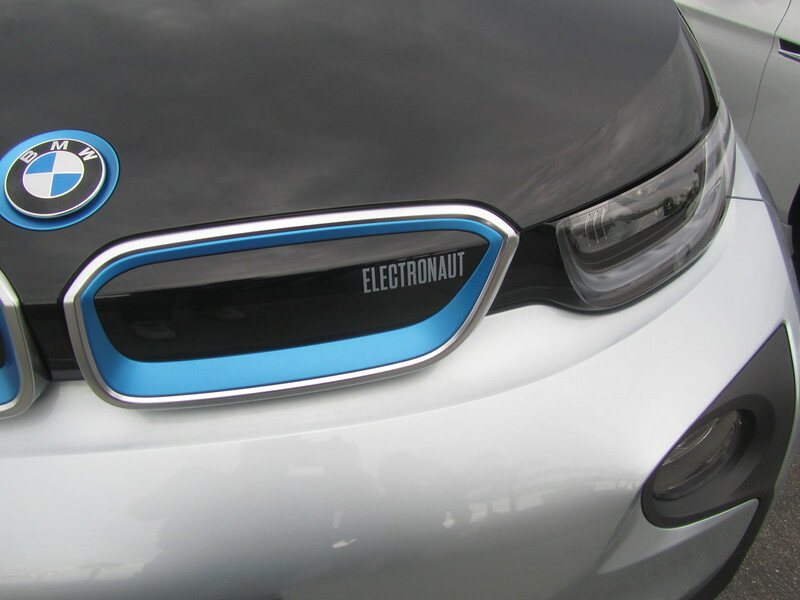 Previous Previous post: Been quiet around here… Orlando EVs? Not so much. I did spot a Zenith Electric Van!